The mission of the US paratroopers was to protect the western flank of the American landing areas. 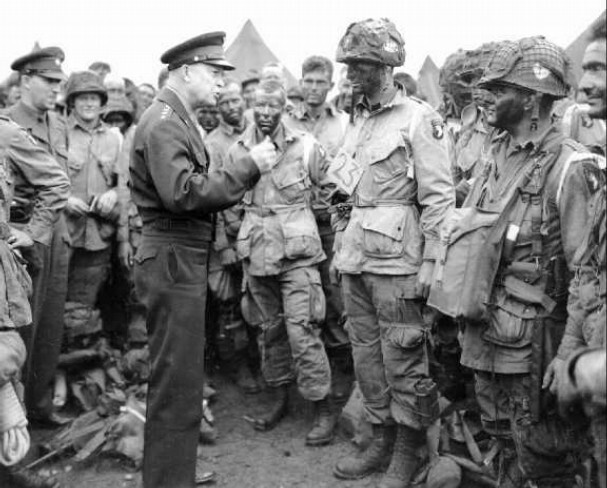 The Allied Forces command decided to drop 2 American Airborne units during the night preceding the invasion: the 82nd and the 101st Airborne Divisions. Sainte-Mère-Eglise is the small Norman village centrally located on the main road running to Cherbourg and it played a vital part in the Airborne planning. 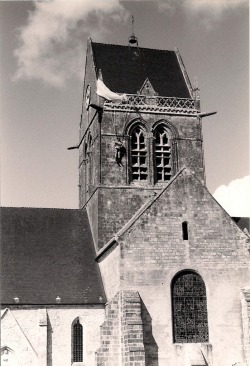 The town was later immortalized in the film "The Longest Day", where the paratrooper John Steel was depicted hanging from the church steeple. Despite the careful planning designed to produce tight, precise drops, the two American airborne divisions were scattered far and wide across the Cotentin peninsula. Although not planned this mistake helped to cause a lot of confusion among the German Army units who were unable to launch an effective counterattack in time. If you are interested in the finer points of the battle fought between the American and German forces here and hearing about what happened to both sides over the course of D-Day as well as the stories of individual heroism that made the men of the 82nd and 101st, then you are at the right place to find out! You can be taken to visit Sainte-Mère-Eglise and the key positions in the surrounding areas where the battles will be explained allowing you to clearly understand what led to success for the US paratroopers on D-Day ! In June and July 1944 the U.S. forces attacked through terrain which was some of the most easily defensible in Europe for the German Army, this terrain being the broken farmlands of Normandy, locally called the Bocage. This fighting against well dug-in troops in well concealed positions caused huge casualties among the attacking Allied forces. HEDGEROW is a topographical term for the growth of hedges and small trees typical of the Normandy region of France. Since Roman times, the Norman farmers have bordered their fields with these hedgerows. Combined with very bad weather in summer 1944, American soldiers encountered stiff resistance from enemy forces in the Norman countryside. The Germans, having gone through specialized training for fighting in hedgerow country, made them pay a heavy price in lives for every foot of ground gained.